Global Banking and Finance Review interview Simon Featherstone, Global CEO, Bibby Financial Services to find out more about Receivable Fianance and how SME’s benefit. Hi Simon, please begin with a brief introduction to Bibby Financial Services and yourself. Bibby Financial Services (BFS) is a leading independent international invoice finance provider, offering expert knowledge and a versatile suite of funding solutions to businesses. BFS provides funding to almost 7,000 small and medium-sized businesses worldwide and has 46 operations spanning Europe, the Americas and Asia-Pacific. Our local expert teams help customers to maximise business opportunities both in their domestic markets and when trading internationally. 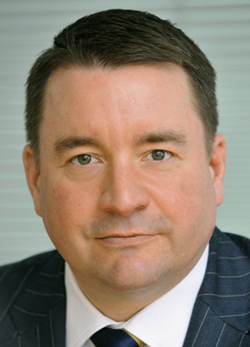 I joined BFS as Global CEO in September 2011, from the position of Managing Director at Lloyds TSB Commercial Finance. I am passionate about supporting SMEs and I believe BFS’s global presence, expertise and local decision making are unique within the industry, adding real value to businesses looking to achieve growth. In addition to my role at BFS, I hold a Non-Executive Director role at Bibby Supply Chain Services Ltd, a £300m turnover logistics specialist. I am also a Board member of the International Factors Group, a global trade association that represents the factoring, invoice financing and asset based lending industry. And I am on the Board of the UK’s Asset Based Finance Association which has been active in supporting the development and implementation of an industry code for the UK. For those that are unfamiliar, what is receivable finance? In the simplest terms, receivables are payments due to a company from external businesses supplied with a product or service. Receivables finance, also known as invoice finance, is a group term which covers all types of funding where the amount of money due on an invoice is advanced by a finance provider to a company until the company receives payment on the invoice. There are different types of products available under the umbrella term of invoice finance, of which the main two are invoice discounting and factoring. Invoice finance can help businesses manage issues such as unreliable cashflow, late payments, overseas trading, fast growth and starting up a business. Factoring is a ‘one-stop shop’ funding and collections facility that helps to bridge the cashflow gap between raising an invoice and getting paid. As well as an immediate cash-injection and an ongoing supply of working capital, businesses also benefit from a credit management and collections service. This saves them valuable time, as the finance provider will chase and collect outstanding invoice payments on the firm’s behalf. Invoice discounting is a funding-only solution. Unlike factoring, the business maintains control of the sales ledger and continues to collect payments from its customers against outstanding invoices. Invoice finance is a dynamic, flexible solution that grows with a business and provides a sustainable alternative to bank loans and other sources of finance. The type of finance service a customer chooses and how customers access these has changed significantly over the past few years. Since the financial crisis there has been a tightening of credit terms and a drastic reduction in the availability of traditional business funding, which has led to more and more firms turning to non-bank funding to satisfy their current and future plans. This has caused the industry to diversify and grow hand-in-hand with the increase in market demand. Whilst invoice finance has been available to businesses for many decades, an increasing number of businesses are becoming aware of it as well as newer services from crowd funding to peer to peer lending. Businesses can now access a wider and more competitive range of funding products, delivered in ways that are flexible and in line with their particular needs. Many smaller companies are looking to access funding in different ways and choosing services that suit how they do business, such as an online finance service that releases funds within hours. There is a very healthy drive towards being truly customer driven with the spotlight on improving service and product range. There is also a real focus on harnessing technology to maximise the customer experience. Finance providers must ensure they are providing the right services to help customers find the type of funding to suit their individual business. What changes would you like to see brought to the sector? Often, the language used by funding providers can be complex and alienate potential customers before they even pick up the phone. Industry bodies play an important part in this, for example the Asset Based Finance Association in the UK has published a glossary of terms to help company owners understand the complexities of the language used in funding applications and processes. However, funding providers also need to take responsibility for ensuring their services are as transparent as possible. Innovation is another key area which could help engage businesses and continue to mould the positive perception of the business funding industry. It is vital that all funding providers evolve their products and services to meet the changing needs of businesses and ensure that they have the right financial support to achieve their potential. I believe there is also always scope to improve on demonstrating the value that working with a finance provider will bring to a customer’s business. Invoice finance experts have the knowledge and ability to advise a customer holistically, looking at the future aspirations of the business and enabling the customer to reach these goals through funding. This can partly be achieved with further investment in education and qualifications for industry members as well as more widespread and innovative marketing. How do inconsistent payment regimes hurt SMEs? Inconsistent payment terms can have a serious impact on the success of an SME. A small business can find it is almost impossible to forecast and plan as it is difficult to predict with any certainty how much income it will take each month if payment terms are not standardised. This uncertainty has the potential to limit a business’ ability to service new orders and therefore grow as the liquidity needed to pay for more staff, raw materials and equipment for example is simply not available. The business must wait for payment on orders already completed before it can take many new orders. This is true for a business whether trading locally or exporting internationally, however differing payment terms between countries can have even more of an impact, as terms can stretch to 90 days or more depending on the business culture of the country you are dealing with. Businesses should take the time to understand payment practices in other countries and move to ensure their payment terms are aligned with local practice. For example, one company we work with in the UK, Oak Exports, trades with several countries around the globe including countries in the EU as well as the United States, Australia, North West Africa and Asia. The owner finds that customers outside of the EU tend to pay more quickly than inside the EU, meaning he has to factor longer terms into the price of goods and build these terms into his business forecast. Increasing awareness of more flexible funding solutions such as invoice finance will also play an important role in enabling SMEs to capitalise on recovery, meet new demand and continue to grow. What are the biggest challenges SMEs are facing? In my experience, the most important challenge still facing SMEs around the globe is an understanding of the many options available when it comes to business finance. It is the responsibility of the industry, along with policy makers and industry bodies, to provide greater education to businesses. Hopefully, as the global economy starts to turn the corner, then you will tend to see SMEs being able to finance more in a growth scenario than you do in a downturn, ironically, because their balance sheets aren’t there to keep pace with their growth. If they’re not educated enough to look at aware of other funding options such as invoice finance, that’s going to be a big challenge for them to fund their growth. It’s a big opportunity in the industry, but it’s a big challenge for SMEs as well. How do you preserve the client/customer relationship for your clients? The relationship we hold with our customers is the most valued part of our business. We know our customers want expert advice, a funding provider that really understands their business and someone at the end of the phone to help whenever needed. We aim to provide all these with dedicated local teams of finance experts and tailored products that support customers with their present and future business aspirations. In a world where many business transactions are done using technology alone, we still value face to face customer contact. Many other finance providers have made cutbacks in this area or are solely internet based, but we offer support in whichever way suits the customer best, whether over the phone, face to face or just online. How do you feel about competition in the market? The market is now seeing a new breed of small companies which are agile and aggressive, and without legacy systems or processes holding them back, they are innovating and changing the marketplace. This will inevitably create further competition as finance providers rush to provide these SMEs with funding that will fit their needs. This gives customers greater choice, which can only be a good thing. Competition is healthy for the marketplace and for businesses, so we very much welcome it. What role if any does Corporate Social Responsibility play at Bibby? CSR is a very important part of Bibby Financial Services and our parent company Bibby Line Group. Bibby Line Group has a “Giving Something Back” programme which sees the Group’s employees collectively raise money each year for charities worldwide. Since its creation, the Bibby Line Group’s Giving Something Back scheme has raised more than £6.9million for a range of charities and in 2013, we contributed to more than £1.3million to 235 employee chosen charities. This year our teams will take part in fund raising events including a community build in Nepal and treks of Ben Nevis and The Great Wall of China. I am an active supporter of several social and charitable organisations and hold an active role in the UK’s Prince’s Trust, as a member of its Midlands Leadership Board, together with providing business mentoring to aspiring entrepreneurs.